As promised, my version of Sorcery, using the rules from ACKS player’s guide. I break them in regards to offensive magic and how often level 2 spells can be used, but I still think they would remain playable. Their power is quick to come to them and they can utilize low level powers with frightening regularity. However, higher level magic is far more difficult for them to take advantage of and they can only use those spells rarely. This makes them balanced against normal mages I think. They advance more quickly, they use lower level spells more often, but the real world shaking powers are the province of true mages. Some people are born with an innate connection to arcane magic in their blood. Often these people have some non-human blood in their ancestry (Tryshallan usually, occasionally draconic). Most develop few, if any, special talents because of their ancestry. But on occasion, a human will begin to develop powers akin to those of a wizard, without the years of training mages require. These sorcerers are regarded with great suspicion and reviled by wizards for the ease which they gain their abilities. Law does not distinguish between sorcerers and mages…if a sorcerer is caught performing magic without the mage vestments, they will suffer just as a mage would. Which, of course, the sorcerers have great grievance with, as they are forbidden from purchasing the robes except through illegal channels. Some mistrustful peasants have lynched emerging sorcerers, especially if their powers manifest violently. The authorities have little issue with these obviously Chaos tainted people perishing, which ironically pushes more sorcerers to the fringes of society where they are the most dangerous. Sorcerers claim that they were the first to develop magic among humans and that wizardry came far later. Some claim that the magic practiced pre-Sundering was sorcerous in nature. Those that follow this belief claim that modern magic came from stealing the secrets of the hereditary blood mages, allowing those of weaker talent access to gifts that rightfully belonged to them. Needless to say, mages hotly deny this idea. Sadly, none may ever know the truth as the histories that survive the Sundering are few. Like mages, sorcerers receive limited combat training. At first level, enchanters hit an unarmored foe (AC 0) with an attack throw of 10+. They advance in attack throws and saving throws only two points every six levels of experience (i.e. the same as mages). They may only fight with quarterstaffs, daggers, darts, or slings. They are unable to use shields, fight with two weapons, or wear any kind of armor. Sorcerer Magic: Sorcerers learn spells innately as spell-like abilities. The spells start weak and grow in strength, but even the greatest sorcerer can only channel so much power. The more potent their abilities the longer they must rest before using them again. Unlike mages, Sorcerers do not need to rest to regain their powers, they must simply wait for the ambient flow of arcane magic to build up within them again. Sorcerer spells are taken from the arcane list, or built as arcane spells. However, it is recommended that they work with the DM to create a list of thematically relevant spells. It is also recommended that they stay away from spells of a more ‘scholarly nature’. Sorcery is wild and unfocused, usually destructive. Spells like Read Magic, Comprehend Languages, or Magic Mouth are a bit too finessed for the feel of a sorcerer. Further, spells that benefit targets are usually (though not always) limited to the sorcerer themselves, and rarely have drawbacks. It is recommended that spells with multiple targets be rebuilt according to the spell creation rules so they function as single target, self or touch spells. The rules for how often a spell can be used are broken slightly as well. 1st level spells can be used once an hour (except detection abilities) unless they take 1 Turn. 2nd level spells can be used 3 times a day, but no more than once an hour, unless they take 1 Turn. 3rd level and above as the Player’s Guide. Spells can be chosen more than once by the sorcerer so they can use them more than once per time unit. So a first level spell could be used twice an hour if taken twice. A second level spell can be used six times a day, no more than twice an hour if it’s chosen twice. However, due to the nature of how their powers work, fourth and higher level powers are usable far less often than a mage could. Again though, they can choose the same power more than once to allow more uses within the same time period (day, week, month, etc). Though sorcerers use magic innately, they are unable (without successful use of their dabbling) to use mage magic item and instead limited to the easiest of items, those used by thieves. When a sorcerer develops the ability to craft items, they are treated as a mage two levels lower than their actual level for purposes of research and creation rolls. This includes any apprentices. 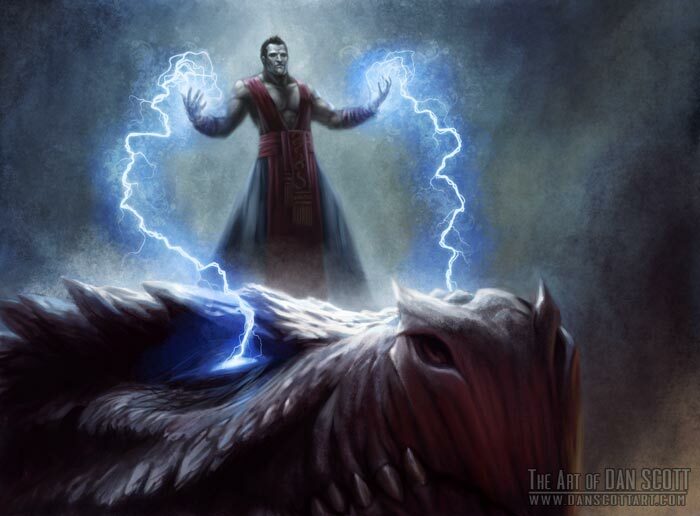 With a GM’s permission, a Sorcerer can change a spell ability they learn. This is a laborious process that mechanically is identical to researching a new spell. The money is spent on reagents and exotic materials, as well as monster parts that contain the proper elemental essences, that they then ingest. If they are successful, their newly researched ability can replace a previously known ability of the same level. I may only be able to call this dragon once a month, but you and your city will long be gone before I need to call it again. A sorcerer may also build a sanctum, often a great tower, when he reaches 9th level. He will then attract 1d6 apprentices of 1st-3rd level plus 2d6 men who believe they might have the gift. Their Charisma and Intelligence scores will be above average, but many will become discouraged and discover they lack the gift after 1d6 months. While in the sorcerer’s service, apprentices must be provided food and lodging, but need not be paid wages. If the sorcerer builds a dungeon beneath or near his tower, monsters will start to arrive to dwell within, followed shortly by adventurers seeking to fight them. Sorcerer Proficiency List: Alchemy, Alertness, Black Lore of Zahar, Beast Friendship, Contortionism, Craft, Diplomacy, Disguise, Elementalism, Familiar, Healing, Illusion Resistance, Knowledge, Language, Magical Engineering, Magical Music, Mimicry, Naturalism, Quiet Magic, Passing Without Trace, Performance, Profession, Running, Sensing Power, Soothsaying, Swashbuckling*, Transmogrification, Unflappable Casting. *Swashbuckling in their case actually represents a magical aura they can project that functions mechanically in the same way. ** Item Crafting and spell research abilities were charged at one ability each when creating the class. It’s arguable whether that is a fair price for them, but I’m not too fussed. This entry was posted in Ahlyen, House Rules, Role-Playing, Sundered Empires.